It is easy to resize images by using any image editing too. You can even use MS Paint to resize images. But resizing animated GIF images is not easy. Some image editors support GIF images but cannot resize all frames. You need to have some image editors which supports resizing all frames of GIF images. 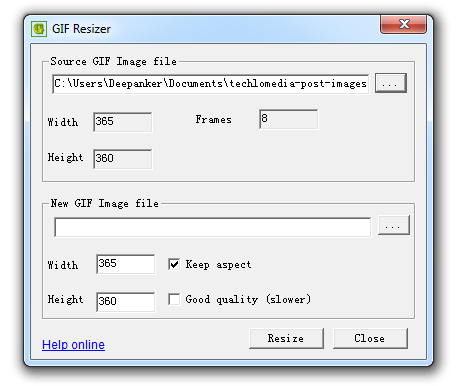 For this, you can use GIF Resizer, popular animated gif resizer tool. It is a portable tool for Windows which can resize animated GIF images without loss in the quality. Use of the tool is very simple. Download the tool in your system and run. Good thing is that it is the portable tool, so you do not need to install it in your system. You can just download and use. You can also carry this tool with you in removable media and use anytime anywhere. After running this tool, select the GIF animated image which you want to compress and it will automatically detect the size and frame of the GIF. Add the new output image path in the location box below. And enter the new image size in the below section. Just enter the new width and keep check box “Keep Aspect” selected. And it will automatically fill the height. Now click on “Resize” to resize the image. In few seconds, it will create a new GIF with specified size. In this way, you will be able to resize any GIF. There is no limit of resizing but increasing the size of GIF will affect the quality. I don’t think there is any need to explain why it will affect quality when you try tri increase the size by increasing height and width. GIF Resizer is a small tool and system requirements are also very less. It still supports Windows 98 and Windows Me like operating systems. Below is the list of system requirements. Try this animated gif resizer tool and see how it works. There are many other similar kinds of tools available to resize GIF image. I will post more similar tools. So, subscribe UseThisTip for more interesting tips and tricks. If you have anything to ask, you can comment below. You can also share your opinion with us via comments.